Jorge Dominguez, a longtime professor in Harvard's government department, was the subject of a report in the Chronicle of Higher Education. It was the early 1980s when Terry Karl complained to Harvard University that a senior scholar had repeatedly made sexual advances toward her. Karl, then an assistant professor of government at Harvard, had never heard the term "sexual harassment," she told the Chronicle of Higher Education. It would be nearly a decade before Anita Hill propelled the issue into the national conversation. Still, Karl knew the behavior of her tenured superior, Jorge Dominguez, was inappropriate, she told the Chronicle. She met with higher-ups, wrote to administrators, called for better reporting practices and filed a complaint with the Equal Employment Opportunity Commission. She ultimately left Harvard, deciding she couldn't handle working in the same circles as him. While Dominguez was disciplined, he was allowed to stay on the faculty. He was even promoted. In the decades that followed, numerous other women say they experienced sexual harassment from the professor, according to accounts published in a story last week in the Chronicle. Harvard's handling of Karl's complaint made other women hesitant to come forward with their own complaints years later, the Chronicle reported. The #MeToo movement helped connect these women and bring their stories to the surface. On Sunday, Harvard's Faculty of Arts and Sciences said it has placed Dominguez on "administrative leave" pending an investigation into the allegations. The division's dean, Michael D. Smith, announced the decision in an email sent to affiliates, according to the Harvard Crimson. 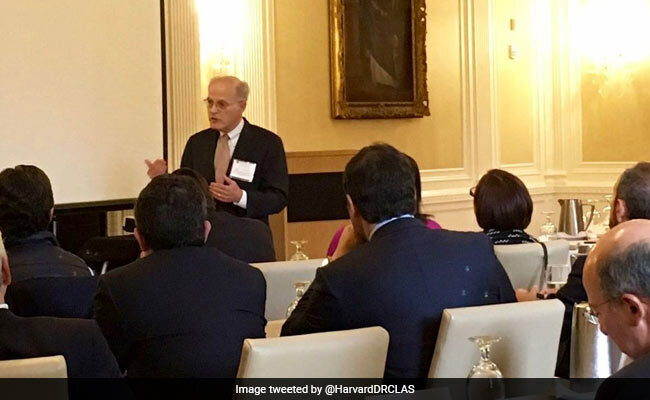 Dominguez, a professor in the government department and chairman of the Harvard Academy for International and Area Studies, is a renowned specialist in Latin America and has taught at Harvard for decades. He is also a senior adviser to the Weatherhead Center for International Affairs and a faculty associate of the David Rockefeller Center for Latin American Studies, according to his online biography. He served as the vice provost for international affairs from 2006 to 2015. Ten women, including Karl, recalled instances to the Chronicle in which Dominguez made them feel uncomfortable. Dominguez refused to comment on Karl's allegations and did not specifically deny any of the women's recollections, but he told the Chronicle that he "has sought to behave honorably in all my relationships." "I try to communicate both respectfully and effectively. I do not go around making sexual advances," he told the Chronicle. "Any behavior like that, I would regret it under any circumstances." "There may have been a terrible misinterpretation of whatever I might have been doing," he added. "I can't imagine trying to hurt or injure someone I might have been helping." Dominguez is not the first academic to face allegations since the explosion of the #MeToo movement. In late November, a former anthropology professor created an anonymously crowdsourced spreadsheet for academics to describe their harassment experiences and responses from their respective universities. By mid-January, the spreadsheet contained more than 2,000 anonymous anecdotes at universities worldwide, according to the Wall Street Journal. In an earlier email to the Harvard community sent Friday, provost Alan M. Garber directly addressed the Chronicle article, saying it was "heartbreaking to read the accounts of former students and faculty who report having suffered inappropriate and unwelcome behavior." "Harvard takes seriously the concerns recently brought to our attention by former students," Garber wrote in the email, which was forwarded to The Washington Post. He said the Faculty of Arts and Sciences immediately began contacting students and postdoctoral students in Dominguez's department to ask about their experiences. "This is a difficult moment for our community, above all for individuals who have experienced sexual or gender-based harassment or sexual assault," he added. "Within this complexity, working conditions and the frequent power asymmetries in working relationships can make it hard for people to know when and how to speak up. And worries that speaking up might have negative repercussions within one's community or field, in the years to come, can also prevent individuals from making a formal complaint, or speaking at all." The government department does not have the authority to dismiss Dominguez, because he is tenured. Only the Harvard Corp. can remove a permanently appointed member of faculty for "grave misconduct or neglect of duty," according to the Harvard Crimson. Government department chair Jennifer L. Hochschild invited students last week to a Friday meeting to discuss the allegations and the "general climate" of the department, according to the Crimson. Students at the meeting voiced frustration and outrage at Dominguez's alleged behavior, the Crimson reported. One student, Carla E. Troconis, said she felt as though she had to take Dominguez's class because he is one of only three professors in the department specializing in Latin American studies. "It can't be a reality that someone like this would be allowed around students, somebody to be admired," she said, according to the Crimson. Some students on Twitter have been calling for the professor's dismissal with the hashtag "#DominguezMustGo." Between 1981 and 1983, Karl told the Chronicle, Dominguez repeatedly touched her inappropriately and tried to kiss her during work settings. She recalled one instance, in November 1981, in which she says Dominguez slid his hand up her skirt and kissed her while telling her he would be the next department chairman. He would be responsible for deciding her promotion and reviewing her book, he told her. He continued to sexually harass her even after she repeatedly pleaded that he stop. After she filed her complaint, Dominguez was found guilty by the university of "serious misconduct." He was removed from administrative responsibilities for three years and barred from reviewing Karl's work or discussing her promotion. Harvard also appointed two "counselors on professional conduct" in the government department to process sexual harassment complaints. The appointed counselors were both men. Her complaint marked only the third known time the university took disciplinary measures against a Harvard professor for sexual harassment. The previous two cases involved incidents between a professor and student, according to a 1983 Crimson article. In November, amid the outpouring of allegations against Harvey Weinstein and other powerful men, another woman, Nienke Grossman, emailed Karl with her own accounts of inappropriate advances from Dominguez. Using social media, Grossman also managed to find two other women with stories about Dominguez. Grossman told the Chronicle she had known Dominguez had been involved in alleged harassment in the 1980s and was under the impression he had not been disciplined. Assuming the university would handle her account in the same way, she declined to file a complaint. By allowing Dominguez to stay on faculty and continue to propel his career at Harvard, Karl said, university officials allowed his behavior to continue. The way they handled the allegations discouraged other women from reporting their own experiences, she said. "That's the great enabling," she said. "It's why the silence is so terrible."